In my last post, I provided an basic interpretation of The Chariot as my Tarot Year Card for 2015, and how it applies to my life for the next twelve months. Basically, this interpretation doesn’t change much from one deck to another. 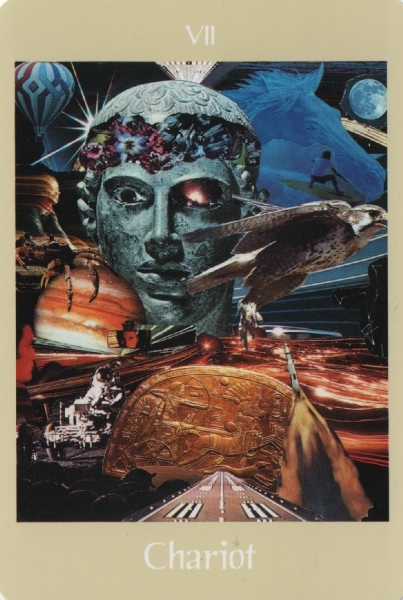 The Chariot is one of those cards that is pretty standard to every tarot deck that you work with, and its definitions don’t change much no matter which deck you are using. And yet each deck is different, and the author of the deck will look at different cards in different ways, depending on her/his own perspectives. 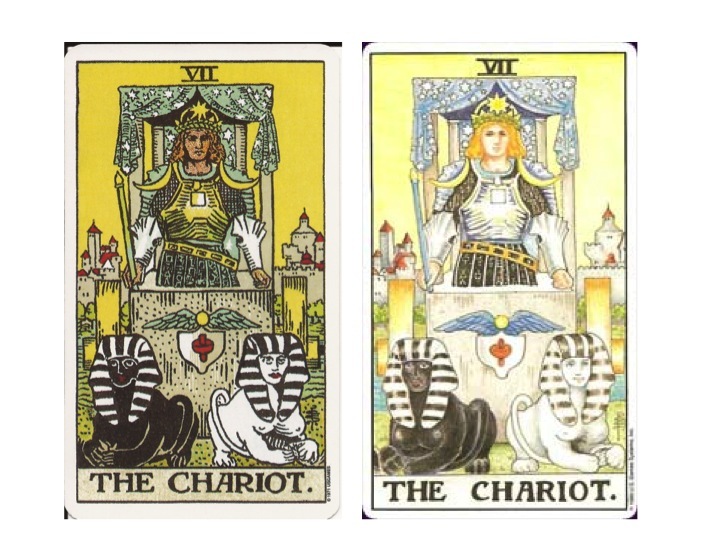 So even while the basic definition of the The Chariot may remain the same, there will be some variation based upon what the author sees in the card. 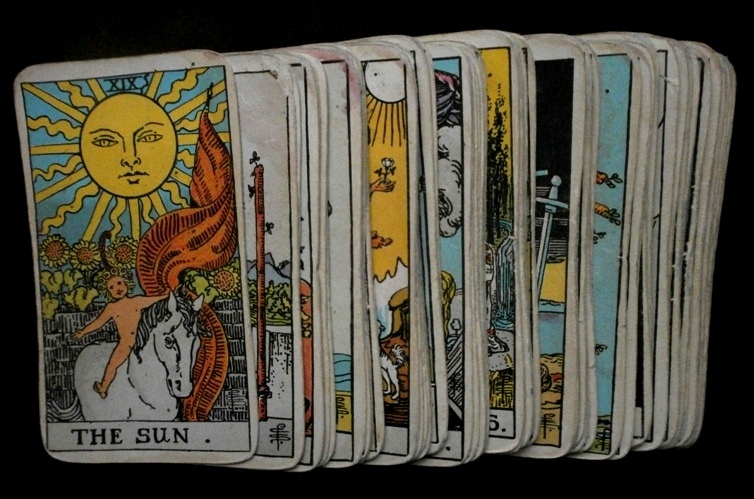 This deck, originally published in 1910, was created by A. E. Waite with illustrations drawn by Pamela Colman Smith, and published by the Rider Company. It remains one of the most popular decks in the world today, and has influenced countless other decks, which basically structure themselves after the illustrations and meanings of the Rider-Waite-Smith. However, while I myself did my beginning studies with this deck 20-something years ago, it is not one of my favorites, and while I do keep it in my collection I rarely work with it. I have since graduated to other decks – many of which follow a similar structure, but with some changes and their own specific themes. There are a few things that bother me about the image of the Chariot from the Rider-Waite-Smith. First of all, it’s a man. Secondly, he’s driving a pair of sphinxes. Thirdly, I’m not crazy about the colors, although they are more appealing when one shifts to the Universal Waite, a variation of this deck that maintains similar images, but utilizes softer colors. Finally, being that I am a Pagan who practices a predominately Wiccan path, I don’t always find that this deck jives with my own spiritual views. It is this final reason that drove me to find the Sacred Circle deck, which continues to be my favorite and most-used deck today. Created by Anna Franklin and illustrated by Paul Mason, this deck – described as “a celtic pagan journey” – is rich in Pagan themes, which borrow heavily from the mythological iconography of the British Isles and Ireland. Being that I love anything and everything Celtic, this is a deck that greatly appeals to me, with its use of beautiful photography to give a sense of naturalism and location that is often lacking in many tarot decks. In the image of The Chariot found in the Sacred Circle deck, the charioteer is a woman – representing Boudicca, the warrior queen of the Iceni, an ancient Celtic tribe that inhabited Britannia (Britain). She is seen standing in her chariot, brandishing a whip by which she urges on her two horses – one white and the other black. This card deviates from the Rider deck in its use of horses in place of sphinxes, a change that I as a born and raised horse-lover particularly appreciate. The Sacred Circle isn’t alone in making this change – many tarot decks do in fact utilize images of horses for this card. But when coupled with Boudicca, it seems to particularly make sense, as the Iceni are often viewed as having been a strong horse-centered culture – in fact, the name Icini (also spelled Ecini) is said to mean “people of the horse,” with the word deriving from eoch, the Gaelic word for horse. Whether or not this is true, Boudicca’s army certainly contained a large number of chariots, so it is only appropriate that in a Celtic-themed deck, she would be featured in this card. The horses represent another Celtic theme – that of the light half of the year (the white horse) and the dark half of the year (the black horse). White horses are generally associated with the sun and with sky deities; black horses with death, chaos, and the Underworld. In this card, the horses represent the animal, instinctive side of human nature. The aggressiveness that goes along with such has to be tamed and controlled. Indeed, this card tells of coming to terms with one’s own aggressive impulses. Throughout the year I need to be careful of using my own aggression in proper ways – not to simply suppress it, but to channel it into a powerful energy that can be used creatively to accomplish objectives. As the driver, Boudicca teaches me to use my intellect to control these potentially destructive instincts, and to use the strength of my will to overcome obstacles. I will need to be determined, self-disciplined, and hard-working. There are no limitations – I can triumph over any difficulties and achieve my goals…I only have to want it enough. From here I move to another Celtic-themed deck – The Celtic Wisdom Tarot created by Caitlín Matthews. 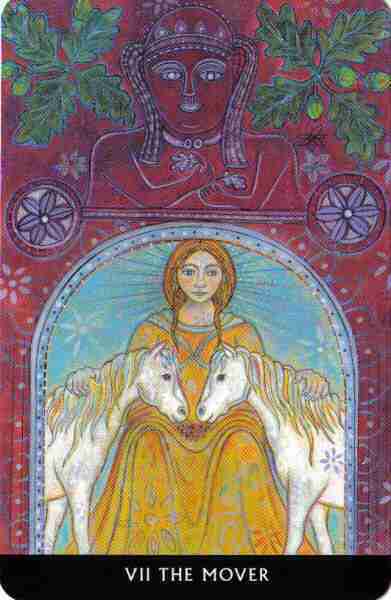 In this deck, the seventh card is known as The Mover, featuring the Celtic horse goddess Epona being watched over by the ancient nameless Goddess of the Chariot – a figure venerated across early Europe. The tribal peoples of ancient Europe migrated from one area to another by means of horse, cart, and chariot. This card suggests the possibility of travel this year, or perhaps even making a move of my own – something I have been considering lately. Much like the Sacred Circle, Caitlín’s card motivates me to act…while at the same time reminding me to stay in control of my circumstances. It encourages me to harness my energies, and to move forward with initiative and self-discipline. The Chariot represents the law of motion. The Indo-European root for chariot is kers, meaning “to run.” The Chariot is always in motion. The mind, heart, body, and spirit are constantly running. Move. Movement brings change, and change brings new experience, learning, and growth – it leads to the achievement of your evolutionary destiny. To be moving is to be alive. This card encourages me to keep moving. It reminds me of a quote I have framed and standing on my altar: “Unmoving water dies.” Apathy, entropy, and atrophy are the forces of death, and inertia is the medium by which they bring about such decline. What I found particularly interesting about the Voyager Tarot was how The Chariot connects to the #7 cards in the four suites of the Minor Arcana (which differs considerably from the Rider deck): harnessing the horse to the chariot, the charioteer breaks through (Seven of Worlds – Breakthrough) the walls of ignorance (Seven of Crystals – Dullness), and with the heart, will and courage of the warrior (Seven of Wands – Courage) confronts and defeats that inner demon of fear (Seven of Cups – Fear), which is every person’s private monster. Fear is the greatest obstacle to change and growth, and it is only by the removal of such that I can move forward to achieve victory. The charioteer searches for self-realization – for the highest point of personal attainment. 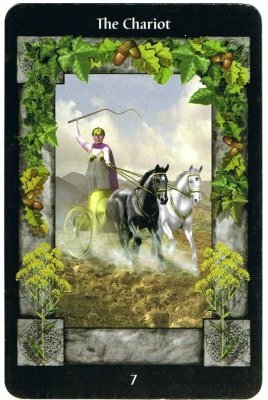 With this card, I’m being encouraged to “go for it!” and the chariot becomes the vehicle by which I can achieve this realization. Find my own way. Trust and work in harmony with that way, and I will reach my goals. But at the same time it warns me not to be overly content to simply rest on my laurels – that I need to honor what I have achieved, and then dedicate myself to even higher successes. The lessons that The Chariot teaches me includes being sure that I have a purpose and a plan of action: that I set goals and objectives, and then the routes and means for their achievement. I need to remember to stay balanced amidst my emotional ups and downs, but to also be courageous and not afraid to take risks when necessary. Since the journey to success will require expending considerable energy and effort, it’s important that I stay in shape – something that I am determined to do this year. There’s a new Planet Fitness opening up close to my house, and I am seriously considering joining and working on getting more fit; I definitely need to shed some pounds and strengthen my body. Finally, I need to stay spiritually centered and aware, and to maintain an inner peace and stillness while in the thick of all this movement and action. From the symbolic collage of the Voyager Tarot I now move to my final and newest deck – The Tarot of the Trees created by Dana Driscoll. This is a beautiful deck consisting of unique hand-painted images of trees and spirals. 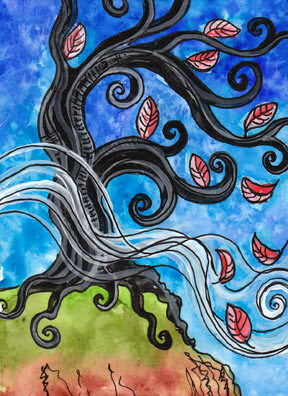 In the seventh card of the Major Arcana, the movement of the Chariot is emphasized by a windblown tree in the fall – its branches bending and growing in the direction of the continual gusts. As one can clearly see from the various interpretations that I have described in this and the previous post, the Chariot is a complex card with layered meanings. It can represent the hero who rides out to battle; or the strength, courage, and confidence that is required to do so. There’s a sense of perseverance with this card – of sticking to the struggle no matter the challenges. That’s what I see in this image. Even though the tree is dangerously close to the edge of the cliff and getting swept about by the wind, it digs its strong roots into the earth to support and sustain it against the elements. There may be moments when I feel overwhelmed – being swept away by all of life’s challenges and close to falling over the edge. It is at times like this that I need to remember to hang in there, to ground and center and draw upon the energy of the earth to get me through. However, I also need to bear in mind the danger of getting swept up in the desire to win – which can be a problem since I am rather competitive. I’m not an athlete, but I do have a bad habit of comparing my successes and accomplishments with others. I’m always feeling the need to “prove myself,” to feel like I’m measuring up to my own potential and to the expectations of others. This card reminds me to take my lessons from a tree: stand tall and proud, but also be content with my own natural beauty… and my own accomplishments. Don’t try to be an oak if you were destined to be a willow. So many decks. So many images. So many lessons. Each of them beautiful, each of them valuable. I am thankful to these cards for what they have to teach me, and to the Spirits for the messages they have sent to me through these cards. I will keep them all in mind as I move through the year.